With twice the LEDs and sections half as long, now it's easy to fit lighting into even smaller parts of your models or add twice as many lights in the same amount of space. No more fiddling with resistor calculations or complicated circuit boards. Just cut, connect, and light! Extremely bright when operated at 12 volts. Brightness can be changed by using different voltages - suitable for 9 to 12 volts, DC. Can be cut at 25mm (1 inch) increments. Integrated 3M pressure sensitive adhesive makes attaching it nearly any model quick and simple. 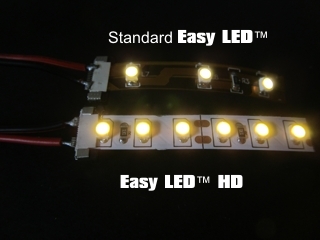 Can be used in the same circuit as any other Easy LED strip. Suitable for all types of models from spacecraft to armor to aircraft. SHIPPING: This product ships at our standard shipping rate. See rate information and policies here. WHOLESALE: This item is available for quantity sales at wholesale pricing. Contact ParaGrafix for details.